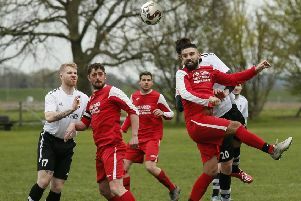 Ampthill Town had a blank holiday weekend when they were beaten twice inside three days by high flying Baldock Town. The Herts side are competing with Crawley Green for second place and won 3-1 at Ampthill Park and then 3-0 at their Stotfold FC base. Town had some good openings in the first period, with Mike Draycott seeing Farmer tip his shot away early on. Ross Airson also had two shots off target as Ampthill looked for a breakthrough. Draycott had a good chance to give Town the lead late in the half but he forced Farmer to make a great save. However, Draycott finally beat the away keeper with a 42nd minute header to put his side ahead. But Ampthill’s lead was short lived as, deep into injury time, Alex Coppin levelled for the Reds. The visitors then took the lead when Ian Robinson helped home a free-kick despite Jack Ambler’s efforts. After Ambler kept out further efforts, Tony James added the third goal five minutes from time when he beat Town’s offside trap. Ampthill were again hit by unavailability on Monday morning when the teams met again, but made their hosts fight for the points. Stand-in keeper Neil Mangan made a great save to keep the scores level. Town had some good opportunities but were hit by two home goals late in the first half, with Tony James finishing off from a Gregson cross before Jack Gregson fired in a free-kick. The second half again saw Town compete well before Tony James finished the scoring with his second goal of the game on 76 minutes. Ampthill finish their home programme on Saturday against near neighbours Crawley Green. Town will be looking for a good display to end a losing league run in recent weeks which has seen them slide down the table.